This article is about a province of China. For the first Chinese aircraft carrier, see Chinese aircraft carrier Liaoning. For other uses, see Liaoning (disambiguation). Liaoning ( 辽宁) is a province located in the northeastern part of China, being the smallest but the most populous province in the region. 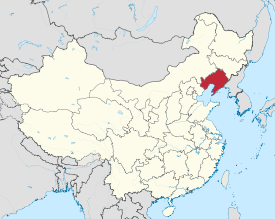 The modern Liaoning province was established in 1907 as Fengtian or Fengtien province and was renamed Liaoning in 1929, also known as Mukden Province at the time for the Manchu pronunciation of Shengjing, the former name of the provincial capital Shenyang. Under the Japanese-puppet Manchukuo regime, the province reverted to its 1907 name, but the name Liaoning was restored in 1945 and again in 1954. "Pacified of the Liao (River)"
Liaoning is the southernmost province of Northeast China, historically also known as Manchuria. It is also known in Chinese as "the Golden Triangle" from its shape and strategic location, with the Yellow Sea (Korea Bay and Bohai Sea) in the south, North Korea's North Pyongan and Chagang provinces in the southeast, Jilin to the northeast, Hebei to the southwest, and Inner Mongolia to the northwest. The Yalu River marks its border with North Korea, emptying into the Korea Bay between Dandong in Liaoning and Sinuiju in North Korea. In the past Liaoning formed part of Korean kingdoms as Gojoseon and Goguryeo, as well as Chinese polities such as the Yan State (of the Zhou Dynasty) and the Han Dynasty. It was also inhabited by non-Han peoples such as Xiongnu, Donghu, Xianbei. In addition, the Balhae, Khitan, Jurchen, Mongol Empire and Northern Yuan ruled Liaoning. The Ming Empire took control of Liaoning in 1371, just three years after the expulsion of the Mongols from Beijing. Around 1442, a defense wall was constructed to defend the agricultural heartland of the province from a potential threat from the Jurchen-Mongol Oriyanghan (who were Ming's tributaries) from the northwest. Between 1467 and 1468, the wall was expanded to protect the region from the northeast as well, against attacks from Jianzhou Jurchens (who were later to become known as the Manchu people). Although similar in purpose to the Great Wall of China, this "Liaodong Wall" was of a lower-cost design. While stones and tiles were used in some parts, most of the wall was in fact simply an earth dike with moats on both sides. Despite the Liaodong Wall, the Manchus conquered Liaodong, or eastern Liaoning, in the early 17th century, decades before the rest of China fell to them. The Manchu dynasty, styled "Later Jin", established its capital in 1616–1621 in Xingjing (兴京), which was located outside of the Liaodong Wall in the eastern part of the modern Liaoning Province (today's ruins of Hetu Ala at Xilaocheng Village in Xinbin Manchu Autonomous County (新宾满族自治县), part of Fushun City). It was moved to Dongjing (east of today's Liaoyang, Liaoning), and finally in 1625 to Shengjing (now, Shenyang, Liaoning). Although the main Qing capital was moved from Shengjing to Beijing after it fell to the Qing in 1644, Shengjing retained its importance as a regional capital throughout most of the Qing era. The Qing conquest of Liaoning resulted in a significant population loss in the area, as many local Chinese residents were either killed during fighting, or fled south of the Great Wall, many cities being destroyed by the retreating Ming forces themselves. As late as 1661, the Civil Governor (Fuyin) of Fengtian Province, Zhang Shangxian reported that, outside of Fengtian City (Shenyang), Liaoyang, and Haicheng, all other cities east of the Liaohe were either abandoned, or hardly had a few hundred residents left. In the Governor's words, "Tieling and Fushun only have a few vagrants". West of the Liaohe, only Ningyuan, Jinzhou, and Guangning had any significant populations remaining. In the latter half of the seventeenth century (starting with laws issued in 1651 and 1653), the imperial Qing government recruited migrants from south of the Great Wall (notably, from Shandong) to settle the relatively sparsely populated area of Fengtian Province (roughly corresponding to today's Liaoning). Many of the current residents of Liaoning trace their ancestry to these seventeenth century settlers. The rest of China's Northeast, however, remained officially off-limits to Han Chinese for most of the Manchu era. To prevent the migration of Chinese to those regions (today's Jilin and Heilongjiang, as well as the adjacent parts of Inner Mongolia), the so-called Willow Palisade was constructed (ca. 1638 – ca. 1672). The Palisade encircled the agricultural heartlands of Fengtian, running in most areas either somewhat outside the old Ming Liaodong Wall, or reusing it, and separating it from the Manchu forests to the northeast and the Mongol grazing lands to the northwest. Later on, the Qing government tried to stop the migrants flow to Fengtian or even to make some settlers return to their original places of residence – or, failing that, to legalize them. For example, an edict issued in 1704 commented on the recent Han Chinese settlers in Fengtian having failed to comply with earlier orders requiring them to leave, and asked them either to properly register and join a local defense group (保; bao), or to leave the province for their original places within the next ten years. Ten years later, naturally, another edict appeared, reminding of the necessity to do something with illegal migrants ... In any event, the restrictive policy was not as effective as desired by the officials in Beijing, and Fengtian's population doubled between 1683 and 1734. During the Qing Dynasty, Manchuria was ruled by three generals, one of whom, the General of Shengjing (Mukden i Jiyanggiyūn) ruled much of modern Liaoning. In 1860, the Manchu government began to reopen the region to migration, which quickly resulted in Han Chinese becoming the dominant ethnic group in the region. In the 20th century, the province of Fengtian was set up in what is Liaoning today. When Japan and Russia fought the Russo-Japanese War in 1904–1905, many key battles took place in Liaoning, including the Battle of Port Arthur and the Battle of Mukden, which was, to that point, the largest land battle ever fought. During the Warlord Era in the early twentieth century, Liaoning was under the Fengtian Clique, including Zhang Zuolin and his son Zhang Xueliang. The province first received its present name on January 29, 1929; the Zhongdong Railway Incident took place later that year. In 1931, Japan invaded and the area came under the rule of the Japanese-controlled puppet state of Manchukuo. The Chinese Civil War that took place following Japanese defeat in 1945 had its first major battles (the Liaoshen Campaign) in and around Liaoning. At the founding of the People's Republic of China in 1949, Liaoning did not exist; instead there were two provinces, Liaodong and Liaoxi, as well as five municipalities, Shenyang, Lüda (present-day Dalian), Anshan, Fushun, and Benxi. These were all merged into "Liaoning" in 1954, and parts of former Rehe province were merged into Liaoning in 1955. During the Cultural Revolution Liaoning also took in a part of Inner Mongolia, though this was reversed later. Liaoning was one of the first provinces in China to industrialize, first under Japanese occupation, and then even more in the 1950s and 1960s. The city of Anshan, for example, is home to one of the largest iron and steel complexes in China. In recent years, this early focus on heavy industry has become a liability, as many of the large state-run enterprises have experienced economic difficulties. Recognizing the special difficulties faced by Liaoning and other provinces in Northeast China because of their heritage of heavy industry, the Chinese central government recently launched a "Revitalize the Northeast" Campaign. It is possible to think of Liaoning as three approximate geographical regions: the highlands in the west, plains in the middle, and hills in the east. The highlands in the west are dominated by the Nulu'erhu Mountains, which roughly follow the border between Liaoning and Inner Mongolia. The entire region is dominated by low hills. The central part of Liaoning consists of a basin drained by rivers such as the Liao, Daliao, and their tributaries. This region is mostly flat and low-lying. The eastern part of Liaoning is dominated by the Changbai Shan and Qianshan ranges, which extend into the sea to form the Liaodong Peninsula. The highest point in Liaoning, Mount Huabozi (1336 m), is found in this region. Liaoning has a continental monsoon climate, and rainfall averages to about 440 to 1130 mm annually. Summer is rainy while the other seasons are dry. Liaoning contains some of the foremost paleontological sites in the world. Known collectively as the Jehol Group, they include the Yixian Formation, Jiufotang Formation and Tiaojishan Formation. 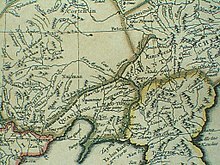 The name Jehol derives from a now defunct provincial division of that name, which covered an area that is now Western Liaoning, Eastern Hebei, and a small part of Inner Mongolia. Fossils were first found there during the 1920s. During the Japanese occupation of the area through the 1930s and early 1940s, more fossils were found, but records of them were lost after World War II ended. The area remained relatively unexplored until the 1990s. It was in 1996 that Liaoning made the headlines with the announcement of the discovery of Sinosauropteryx prima, the first example of a filamented "feathered" dinosaur. Sinosauropteryx prima was a small feathered meat-eating dinosaur, from the Lower Cretaceous Yixian Formation. This discovery pushed the evolution of feathers back in time and showed that dinosaurs, not only birds, had feathers. It also showed a direct evolutionary link between theropod dinosaurs and modern birds. Since then, dozens of ground-breaking finds have been discovered throughout the Jehol group. These including the earliest flower, earliest eutherian mammal, known as Eomaia, the earliest known metatherian, an intact embryo of a pterosaur, Repenomamus robustus—a 15 kg heavy mammal that ate dinosaurs, Sinornithosaurus millenii, as well as many birds and feathered dinosaurs. Discoveries such as Dilong paradoxus, another feathered theropod, date to the early Cretaceous Period. This is some 60 million years before Tyrannosaurus, and thus these discoveries push the evolution of feathers earlier than previously thought. The Liaoning fossils are noted for their high degree of preservation—often including soft body tissues, which is rare. Aside from the famous birds and feathered dinosaurs, the Liaoning fossils include insects, fish, aquatic arthropods, and plants. The Liaoning deposit is widely considered to be the one of the world's premier fossil sites. The high level of preservation is believed to be due to how the animals died. The area was volcanically active, and large plumes of volcanic dust repeatedly covered the area, instantly killing and burying any living thing in the area. The extremely fine grain of the sediment and the chemical composition of the ash prevented the usual bacterial decay. In some specimens, extremely fine details can be seen such as the proboscis of the bee Florinemestruis used to drink nectar from the earliest flowers. In other specimens, colours are still visible, including stripes on fish and spots on turtles. The politics of Liaoning is structured in a single party-government system like all other governing institutions in mainland China. The Governor of Liaoning (辽宁省省长) is the highest-ranking official in the People's Government of Liaoning. However, in the province's single party-government governing system, the Governor has less power than the Communist Party of China Liaoning Provincial Committee Secretary (辽宁省委书记 for short), colloquially termed the "Liaoning Party Chief". Previous to 1949 and the takeover of the Communist forces, Liaoning was governed by the Fengtian clique of warlords and interchangeably officials of the Chiang Kai-shek bureaucracy. During the Qing Dynasty Liaoning was known as the province of Fengtian (奉天), and was governed by a zǒngdū or Viceroy (The Viceroy of the Three Eastern Provinces, 东三省总督), along with the provinces of Jilin and Heilongjiang. The province itself also had a governor (巡抚; xúnfǔ). These prefecture-level cities are in turn divided into 100 county-level divisions (56 districts, 17 county-level cities, 19 counties, and 8 autonomous counties), which are then further subdivided into 1511 township-level divisions (613 towns, 301 townships, 77 ethnic townships, and 520 subdistricts). At the end of the year 2017, the total population is 43.69 million. ^ a b New district established after census: Liaozhong (Liaozhong County). The new district not included in the urban area & district area count of the pre-expanded city. ^ a b New district established after census: Pulandian (Pulandian CLC). The new district not included in the urban area & district area count of the pre-expanded city. ^ a b New district established after census: Dawa (Dawa County). The new district not included in the urban area & district area count of the pre-expanded city. Liaoning has the largest and wealthiest provincial economy of Northeast China. Its nominal GDP for 2017 was 2.39 trillion yuan (ca. US$354 billion), making it the 14th largest in China (out of 31 provinces). Its per capita GDP was 54,745 yuan (US$8,108). Among the three provinces of Northeast China, Liaoning is the largest in terms of GDP and GDP per capita. In 2008, Liaoning was the region with the highest GDP growth among global G8x8, the eight provinces or states below national level with the highest GDP of the top eight GDP nations. According to preliminary statistics, Liaoning maintained its GDP growth rate of 13.1 percent in 2009 and held its position as the province with the highest economic growth. Economic growth has since slowed down, with the economy expanding 3% in 2015 and contracting 1.3% in the first quarter of 2016. Leading industries include petrochemicals, metallurgy, electronics telecommunications, and machinery. On a national level, Liaoning is a major producer of pig iron, steel and metal-cutting machine tools, all of whose production rank among the top three in the nation. Liaoning is one of the most important raw materials production bases in China. Industries such as mining, quarrying, smelting and pressing of ferrous metals, petroleum and natural gas extraction, are all of great significance. Meanwhile, Liaoning is an important production base of equipment and machinery manufacturing, with Shenyang and Dalian being the industrial centers. Enterprises such as Shenyang Jinbei Co. Ltd., Daxian Group Co. Ltd., and Shenyang Machine Tool Co. Ltd., are leaders in their sectors. The province’s light industry mainly focuses on textiles and clothing industries which include cotton and wool spinning, chemical fiber production, knitting, silk production, and the manufacturing of both garments and textile machinery. In 2008, its tertiary industry accounted for 34.5 percent of total GDP. In the future, Liaoning will continue its efforts to restructure large and medium-sized state enterprises. Meanwhile, the province will concentrate in developing its four pillar industries – petrochemicals, metallurgy, machinery and electronics. Main agricultural products of Liaoning include maize, sorghum, and soybeans. The region around Dalian produces three-quarters of China's exported apples and peaches. Cotton is also produced. Liaoning's fruits include apples from Dalian and Yingkou, golden peaches from Dalian, pears from Beizhen of Jinzhou, white pears from Huludao and Suizhong, and apricots and plums from Gushan of Dandong. Liaoning has the most iron, magnesite, diamond, and boron deposits among all province-level subdivisions of China. Liaoning is also an important source of petroleum and natural gas. Salt is produced along the coast. Along with Liaoning's rich mineral reserves, the province also has abundant deposits of crude oil, especially in the Liaohe Oilfield. Liaoning is one of China's most important industrial bases, covering a wide range of industries, such as machinery, electronics, metal refining, petroleum, chemical industries, construction materials, coal, and so on. The sea off Dalian abounds with quality seafood, such as abalones, sea cucumbers, scallops, prawns, crabs, and sea urchins. The big fish of Dandong, the jellyfish of Yingkou, and the clams of Panjin are known worldwide for their good tastes right from the sea and in products made in Liaoning for export domestically and internationally. The cities of Dalian, Dandong and Yingkou have been developed as major ports and economic gateways to all of northeast China. Of the development zones formally recognized by the PRC State Council, 56 are located in Liaoning, including 14 on the national level and 42 on the provincial level. These zones are further grouped into Economic Development Zones, High-Tech Zones, Free Trade and Export Processing Zones, and Special Development Zones. In October 1995, the Shenyang Cross-Strait Science Industrial Zone was approved to be established by State Council. The Shenyang Cross-Strait Science Industrial Zone is the only zone established as part of the Shenyang Hunnan Hi-Tech Industrial Development Zone. It has a total area of 5 km2 (1.9 sq mi). It welcomes international investment. It focuses on the development of instruments manufacturing, telecommunication, bio-pharmaceuticals, electronics, and new materials. The Liaoning Shenyang Zhangshi Export Processing Zone was approved to be established by the state government in June 2005. It is located in the national-level Shenyang Economic & Technological Development Zone, with a planned area of 62 km2 (24 sq mi) and current area of 14.1 km2 (5.4 sq mi). It encourages and focuses on the development of auto and auto parts, electronics, precision machinery, new energy, new materials, and the fine chemical industry. The Shenyang Hunnan Hi-Tech Industrial Development Zone used to be called the Shenyang Hi-Tech Industrial Development Zone. Established in 1988, it is a national high-tech development zone approved by the State Council. The zone is located in western Shenyang City with an area of 32 square kilometres (12 sq mi). Its encouraged industries include electronic information, new materials, biological engineering, energy saving, and environmental protection. The Dalian Economic & Technological Development Zone (now known as the "Dalian Development Area") was established in September 1984, as one of the first of the China National Economic and Technological Development Zones. The zone had a GDP of 70.31 billion yuan in 2007 and the total volume of its import and export trade was 14.92 billion dollars, which accounts for a quarter of such trade for all of Liaoning Province. Most of the enterprises in Dalian ETDZ are factories owned by foreign enterprises, especially from Japan, South Korea and the United States, such as Canon, Pfizer, Toshiba, and Intel. The Dalian Export Processing Zone was approved to be set up by the State Council in April 2000, with a planned area of 2.95 km2 (1.14 sq mi). It is divided into two parts, A Zone and B Zone. A Zone has a construction area of 1.5 km2 (0.58 sq mi), and started operation in May 2001. All the basic infrastructure is available, which includes road, water, gas, and power supply, telecommunication, and so on. A Zone promotes industries such as home appliances, lighting, machinery, construction materials, and medical instruments. The Dalian Free Trade Zone was approved to be set up by the government in May, 1992. Policies include duty-free trade. It has attracted some leading industries, such as electronics, machinery, and plastics. The Dalian Hi-Tech Industrial Development Zone was approved to be a national-level development zone in 1991. It has a total area of 35.6 square kilometres (13.7 sq mi). It focuses on and encourages the following industries: electronic information, bio-pharmaceuticals, and new materials. The Dandong Border Economic Corporation Zone was approved to be a national-level development zone in 1992. It is located in the bank of Yalu River, and opposite Sinuiju, a North Korean city. It promotes industries such as electronic information, machinery manufacturing, and bio-pharmaceuticals. The Central Liaoning city cluster is a megalopolis centered on Shenyang (urban population 4 million). Within its 150 km (93 mi) radius, it includes Anshan (urban population 1.3 million), Fushun (1.3 million), Yingkou (1.1 million), Benxi (0.95 million), Liaoyang (0.7 million), and Tieling (0.4 million). In April 2010, the State Council of the People's Republic of China approved a national development strategy for the Shenyang Metro Area. The core of this strategy is innovation in industrial development, integration of the eight cities, integration of urban and rural areas as well as the promotion of more market-oriented development. The Party Secretary of the Liaoning Provincial Committee of the Communist Party of China, Li Keqiang, initiated the development of a strategy entitled "5 Points and One Line", which he first proposed on a visit to Yingkou in late 2005. Liaoning Province formally launched the development strategy for the entire Liaoning coastline in early 2006, so as to re-invigorate the provincial economy from its traditional status as a "rustbelt" of Chinese state-owned enterprises. The "Five Points" indicate five key development areas in the province and cover seven zones: the Changxing Island Harbor Industrial Zone in Dalian; Yingkou Coastal Industrial Base; Liaoxi Jinzhou Bay Coastal Economic Zone; Dandong, and the Zhuanghe Huayuankou Industrial Zone. The five zones together cover a planned area of nearly 500 square kilometres (190 sq mi). The "One Line" mentioned in the strategy represents a new series of motorways along the coast. The coastline of 1,433 kilometers will become the connection between the five above zones, through which 6 provincial cities, 21 counties and 113 towns will be interlinked. Coastal motorways directly connect the entire string of five zones along the Bohai sea. Liaoning Province was known as Fengtian Province until 1929. Shenyang part of Liaoning Province until 1947; dissolved in 1954 and incorporated into Liaoning Province. Dalian (Lüda) part of Liaoning Province until 1947; dissolved in 1954 and incorporated into Liaoning Province. Andong Province (Liaodong Province) split from Liaoning Province in 1947; dissolved in 1954 and incorporated into Liaoning Province. Liaobei Province split from Liaoning Province in 1947; dissolved in 1949 and parts were incorporated into Liaoning Province. Rehe Province incorporated into a province in 1928; dissolved in 1955 and parts were incorporated into Liaoning Province. Liaoxi Province split from Liaoning Province in 1949; dissolved in 1954 and incorporated into Liaoning Province. The population of Liaoning is mostly Han Chinese with minorities of Manchus, Mongols, Hui, Koreans and Xibe. Excludes members of the People's Liberation Army in active service. According to a 2012 survey only around 10% of the population of Liaoning belongs to organised religions, the largest groups being Buddhists with 5.5%, followed by Protestants with 2.2%, Muslims with 0.6% and Catholics with 0.2%. The reports didn't give figures for other types of religion; around 90% of the population may be either irreligious or involved in Chinese folk religions (cults of nature deities and ancestors), Buddhism, Confucianism, Taoism, folk religious sects. The significant Manchu population, although strongly assimilated to the Han Chinese and practicing Chinese religions, also retains its own pure Manchu shamanism. At the same time, the local religion of the Han people throughout Manchuria has developed patterns of deities, ideas, and practices inherited from Manchu and Tungus shamanism, making it quite different from central and southern Chinese folk religion. The Mongol ethnic minority either follows the Mongolian folk religion and shamanism, or Tibetan Buddhism. The Mukden Palace was the palace of the Qing Dynasty emperors before they conquered the rest of China and moved their capital to Beijing. Though not as large nor as well known as its counterpart (the Forbidden City) in Beijing, the Mukden palace is significant for its representation of palace architecture at the time, and has recently been included on the UNESCO World Heritage Site as an extension of the Imperial Palace site in Beijing. In addition, three imperial tombs dating from the Qing Dynasty are located in Liaoning. These tomb sites have been grouped with other Ming and Qing Dynasties tombs (such as the Ming Dynasty Tombs in Beijing, and the Ming Xiaoling Mausoleum in Nanjing) as a combined UNESCO World Heritage Site. Wunu Mountain City, a Goguryeo site found in Huanren Manchu Autonomous County, is part of a combined UNESCO World Heritage Site that also includes sites in Ji'an, Jilin. Benxi offers a boat ride though a large stalactite filled cave and underground river. Anshan hosts the Jade Buddha Palace, the largest Buddha statue made of jade in the world. Liaoyang, one of the oldest continuously-inhabited cities in northeast China, has a number of historical sites, including the White Pagoda (Baita), that dates to the Yuan Dynasty. The port city of Dalian, located on the tip of the Liaodong Peninsula, is a tourist destination in its own right, with beaches, resorts, zoos, seafood, shopping, Russian- and Japanese-era heritage architecture, and streetcars, a rare sight in China. Dandong, on the border with North Korea, is a medium-sized city that offers a cross-river view of the North Korean city of Sinŭiju. Bijia Mountain is a curious island which joins to the mainland at low tide by a land bridge. ^ "Doing Business in China - Survey". Ministry Of Commerce – People's Republic Of China. Archived from the original on 5 August 2013. Retrieved 5 August 2013. ^ "Communiqué of the National Bureau of Statistics of People's Republic of China on Major Figures of the 2010 Population Census  (No. 2)". National Bureau of Statistics of China. 29 April 2011. Archived from the original on July 27, 2013. Retrieved 4 August 2013. ^ 辽宁省2017年国民经济和社会发展统计公报 [Statistical Communiqué of Liaoning on the 2017 National Economic and Social Development] (in Chinese). Liaoning Bureau of Statistics. 2018-02-25. Retrieved 2018-06-22. ^ "China National Human Development Report 2016" (PDF). United Nations Development Programme. p. 146. Retrieved 2017-12-05. ^ "Liaoning Travel Guide: Map, History, Sightseeing, Ethnic Minority, Climate". Retrieved 2010-03-14. ^ 先秦辽阳地区部族问题初探. Archived from the original on 2011-07-07. Retrieved 2011-01-16. ^ John W. Dardess (2012). Ming China, 1368-1644: A Concise History of a Resilient Empire. Rowman & Littlefield. pp. 18–. ISBN 978-1-4422-0490-4. ^ Edmonds, Richard Louis (1985). Northern Frontiers of Qing China and Tokugawa Japan: A Comparative Study of Frontier Policy. University of Chicago, Department of Geography; Research Paper No. 213. pp. 38–40. ISBN 0-89065-118-3. ^ "Xingjing". Archived from the original on 2010-03-04. Retrieved 2009-03-26. ^ "Dongjing". Archived from the original on 2010-03-04. Retrieved 2009-03-26. ^ Chen, P-J., Dong, Z-M., Zhen, S-N. 1998. An exceptionally well-preserved theropod dinosaur from the Yixian Formation of China. Nature. Vol. 391:14.–152. ^ Vaughan, Terry A; Ryan, James M.; Cheshire, Leonard; Czaplewski, Nicholas J. (2011). Mammalogy. Jones & Bartlett Publishers. pp. 114–116. ISBN 1449644376. ^ a b c Manning, Phillip Lars (2008). Grave Secrets of Dinosaurs: Soft Tissues and Hard Science. National Geographic Books. ISBN 1426202199. Retrieved 23 July 2014. ^ Selden, Paul; Nudds, John (2012). Evolution of Fossil Ecosystems. Elsevier. pp. 168–182. ISBN 0124046371. ^ a b Brusatte, Stephen L. (2012). Dinosaur Paleobiology, Volume 1 of TOPA Topics in Paleobiology. John Wiley & Sons. pp. 75–77. ISBN 1118273559. Retrieved 23 July 2014. ^ a b c Norell, Mark; Gaffney, Eugene S.; Dingus, Lowell (2000). Discovering Dinosaurs: Evolution, Extinction, and the Lessons of Prehistory. University of California Press. pp. 214–216. ISBN 0520225015. ^ 中华人民共和国县以上行政区划代码 (in Chinese). Ministry of Civil Affairs. ^ Shenzhen Bureau of Statistics. 《深圳统计年鉴2014》 (in Chinese). China Statistics Print. Retrieved 2015-05-29. ^ Census Office of the State Council of the People's Republic of China; Population and Employment Statistics Division of the National Bureau of Statistics of the People's Republic of China (2012). 中国2010人口普查分乡、镇、街道资料 (1 ed.). Beijing: China Statistics Print. ISBN 978-7-5037-6660-2. ^ Ministry of Civil Affairs (August 2014). 《中国民政统计年鉴2014》 (in Chinese). China Statistics Print. ISBN 978-7-5037-7130-9. ^ "China Liaoning Business Guide". Archived from the original on 2010-07-05. Retrieved 2010-08-14. ^ "China Liaoning Business Guide". Archived from the original on 2010-07-01. Retrieved 2010-08-23. ^ 1912年中国人口. Retrieved 6 March 2014. ^ 1928年中国人口. Retrieved 6 March 2014. ^ 1936-37年中国人口. Retrieved 6 March 2014. ^ 1947年全国人口. Retrieved 6 March 2014. ^ 中华人民共和国国家统计局关于第一次全国人口调查登记结果的公报. National Bureau of Statistics of China. Archived from the original on August 5, 2009. ^ 第二次全国人口普查结果的几项主要统计数字. National Bureau of Statistics of China. Archived from the original on September 14, 2012. ^ 中华人民共和国国家统计局关于一九八二年人口普查主要数字的公报. National Bureau of Statistics of China. Archived from the original on May 10, 2012. ^ 中华人民共和国国家统计局关于一九九〇年人口普查主要数据的公报. National Bureau of Statistics of China. Archived from the original on June 19, 2012. ^ 现将2000年第五次全国人口普查快速汇总的人口地区分布数据公布如下. National Bureau of Statistics of China. Archived from the original on August 29, 2012. ^ "Communiqué of the National Bureau of Statistics of People's Republic of China on Major Figures of the 2010 Population Census". National Bureau of Statistics of China. Archived from the original on July 27, 2013. Wikimedia Commons has media related to Liaoning. Wikivoyage has a travel guide for Liaoning.